Hotel Rose Rayhaan by Rotana, Dubai, United Arab Emirates - Lowest Rate Guaranteed! A stay at Rose Rayhaan by Rotana places you in the heart of Dubai, a 3-minute drive from Dubai International Financial Centre and 8 minutes from Dubai Garden Glow. 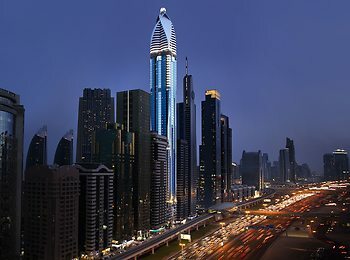 This 4-star hotel is 2.5 mi (3.9 km) from Dubai Mall and 2.8 mi (4.5 km) from Burj Khalifa. Logos, brands, and other trademarks featured within this site are the property of their respective trademark holders. These trademark holders are not directly affiliated with Hotelsone. Rotana is a registered trademark.© 2001 - 2019 HotelsOne. All rights reserved.